Words of the Wise Acres: To get good well water is divine. To get good well water is divine. Flickr image courtesy of futurowoman. For our own peace of mind, as well as the peace of minds of our families, the bank, and pretty much anyone to whom we mentioned this move, we had to have the property inspected. This meant an inspection of the house itself, the septic system (a lagoon! ), and a well. We've never had a well, and I thought I'd share some of what I've learnt. 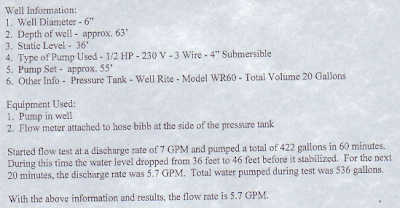 Also, this record will be handy when we need to inspect the water quality again. First, the good news. Based on the lab "bacteriological results are potable as per the 2006 Guidelines for Canadian Drinking Water". I didn't even know, though I guess I would have guessed if asked, that there was such as a thing as the CDWG - Canadian Drinking Water Guidelines. Why to I think this is so cool? I've never had the luxury of being fully responsible for my water supply. 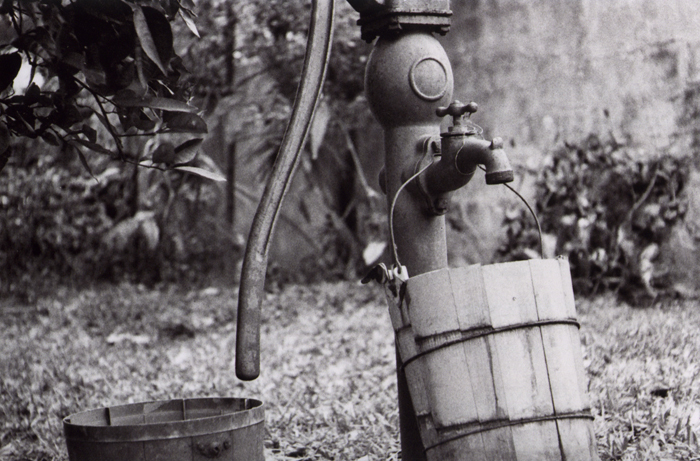 Modern conveniences have stolen this from us, forcing us to treat water as an unlimited resource. (Granted, water metering is slowly being rolled out.) And even if I was conscious of our water usage over time, I didn't think twice about from where it came or how it got from there to me. Now, we'll be blessed with complete control and responsibility. If we run out, it's because we used it (wisely or otherwise). It's coming from around 50 feet below our property (being pushed out by a pump in the well 55' down, because it's easier to push water out than to pull it out, it so happens). When I hear about cities suffering hardship due to water turbidity during flooding or heavy rainfall, those consumers are so far down the supply chain that they cannot solve the problem - they can only buy or boil, and wait. We may run out after a few loads of laundry, but based on the test results that seems unlikely, and the well level will quickly catch up. Besides, we are going to be watching our usage very closely - we don't want to deplete this natural resource, because if we do, we don't have a supply chain to blame. Hi, I'm looking at buying a home with a well and am wondering how your venture has gone? I am slowly reading your blog (and love it). Basically, my husband is against the well water but I think it would help us be less reliant and be able to homestead, as you all are. I'd love to talk to you if you have time about the water issues and see what you think as an owner. Hi, was wondering what were the costs of all your inspections and tests? And were any mandatory to buying the property or were they all just for your peace of mind? A Word to the "Why's"